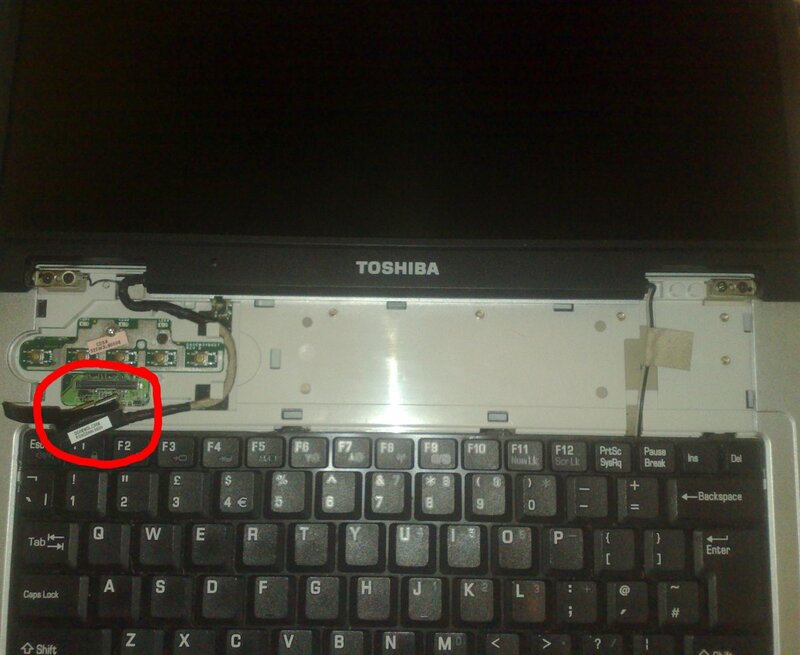 This is a guide on how to disassemble the Toshiba Satellite Pro L10 laptop. It could also apply to other laptops in the Toshiba Satellite Pro laptops, particularly those in the L series. Start by closing the laptop lid, unplugging the computer from the wall and turning it over. The first step will be to unscrew all of the screws on the back (red). 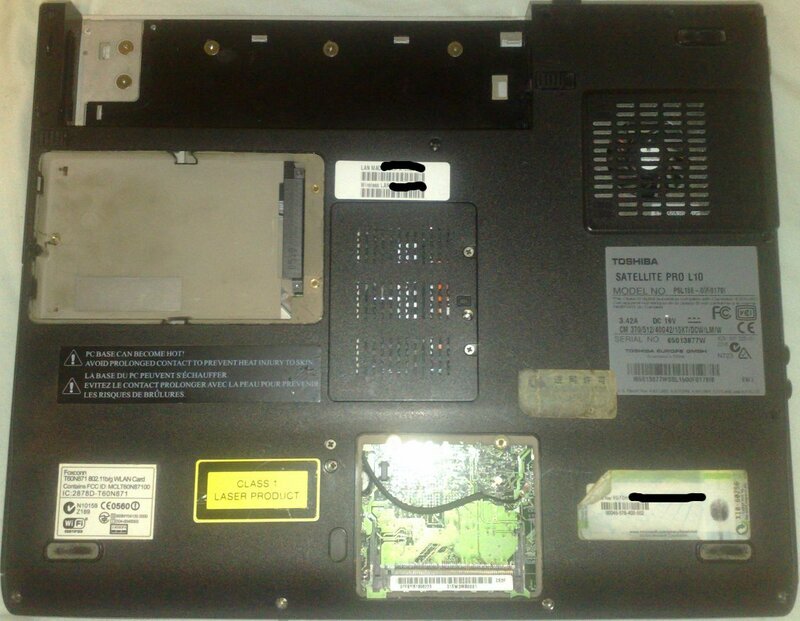 Note that it is not necessary to unscrew the RAM cover (the panel with the holes in it), though you will need to remove the hard drive cover (the large panel on the left) and the Wireless LAN cover (bottom). 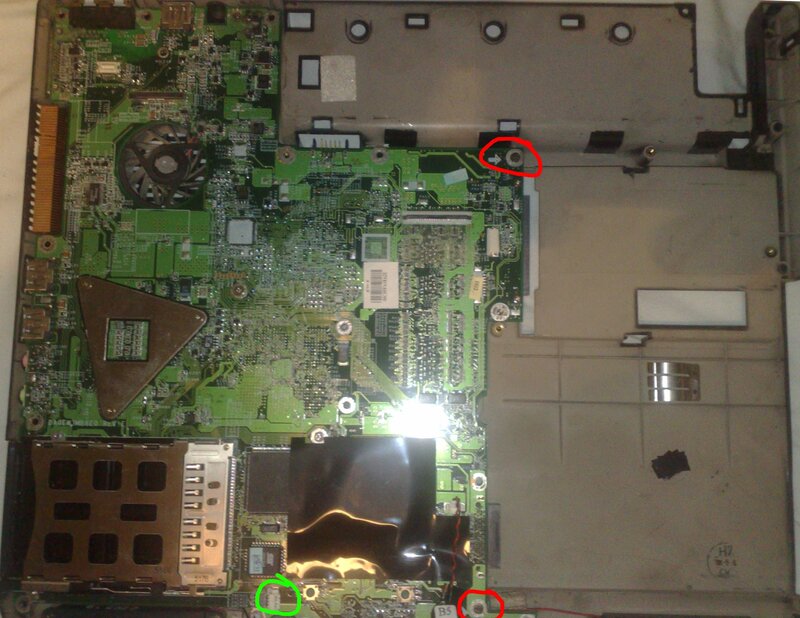 The battery should also be removed using the two clips circled in green. There are no screws under the rubber feet. Take off the Wireless LAN cover. Underneath will be the WLAN card with 2 wires attached to it with small clips. You should remove the Wireless LAN card and detach these 2 wires carefully. You may find it easier to remove the card first before attempting to detach the wires. To remove the card, pull the two levers (red) away from the card and gently push the card towards you with a small screwdriver or finger. 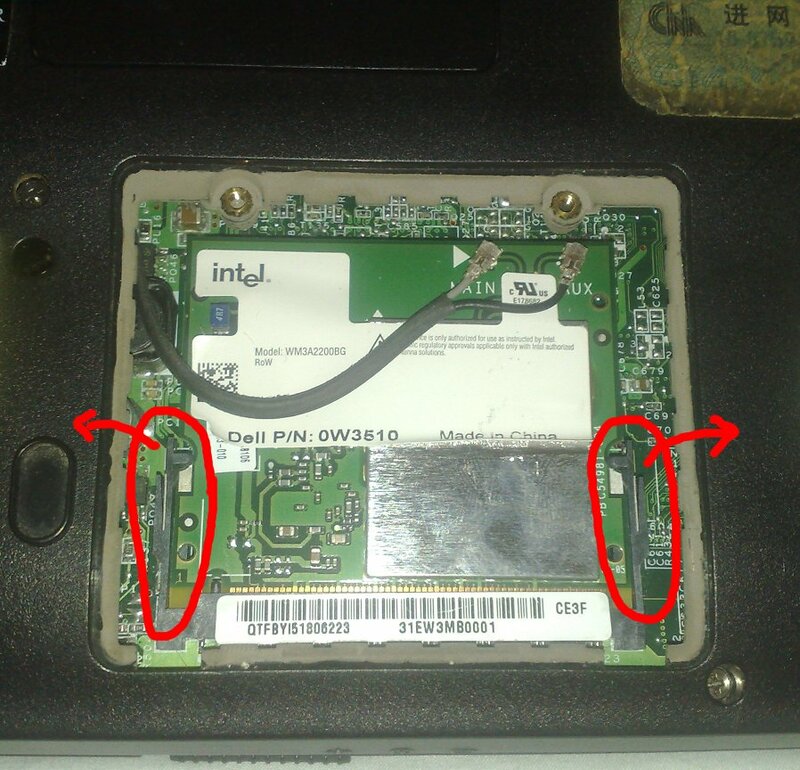 Remove the hard drive cover and unscrew the screw found underneath. Using the plastic tab on top of the hard drive, gently pull the hard drive to the left and eventually upwards. Turn the laptop around so that the back of the laptop is facing you. You will see 3 more screws (red). 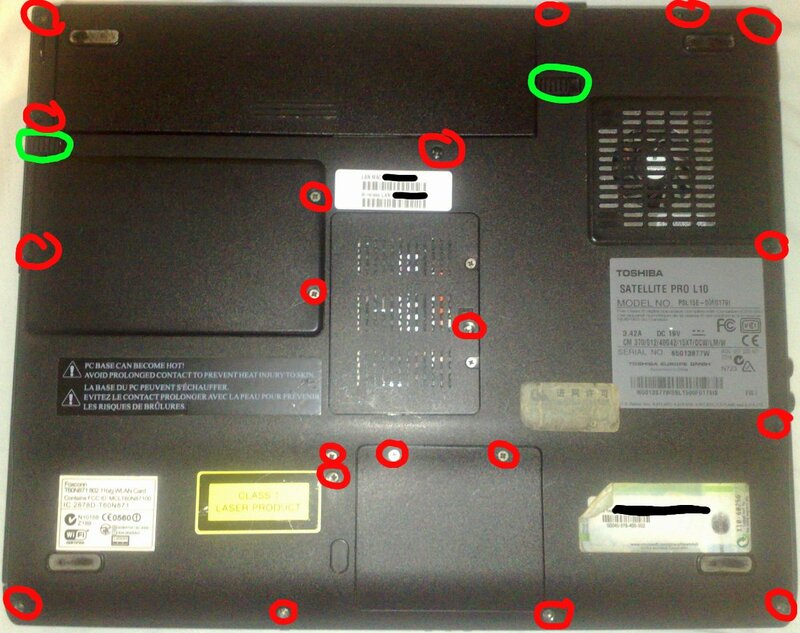 Remove these and open the laptop lid fully so that the laptop is lying flat, with the back of the laptop upwards. With a small screwdriver, unclip the little clips (red) that would appear underneath the battery until the majority are unclipped. It isn’t necessary to unclip them all. With the laptop still fully open, flip it over so that the keyboard is facing you. With a small flat-head screwdriver, lift up and remove the cover at the top of the keyboard which will have been partially detached in step 5. 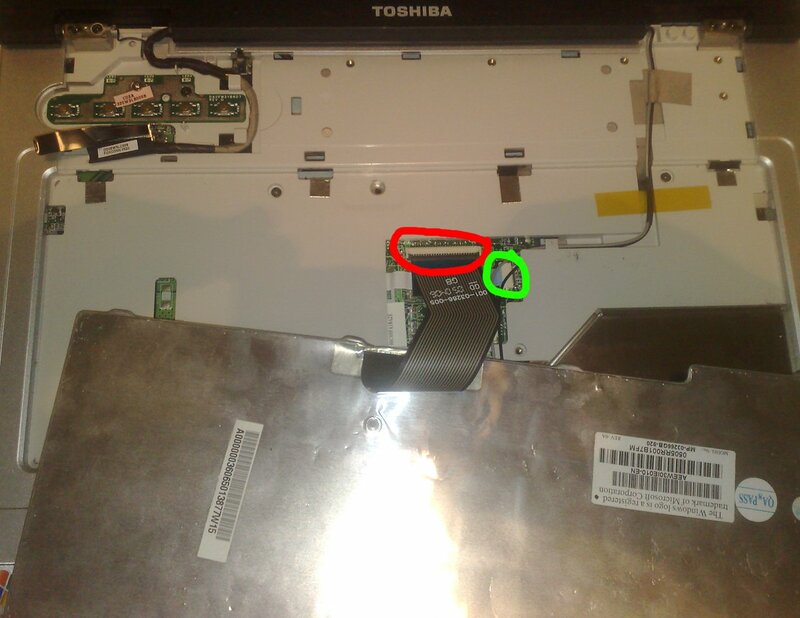 Using the plastic tab, remove the screen connector from the motherboard (red). The keyboard should come out very easily, simply by very gently using a flat-head screwdriver along the top edge. If you need to use any force to remove it, check that you have removed all the screws from the underside of the case (step 1) beforehand. It’s very easy to bend the keyboard if you apply too much force here. Lift the tab attaching the keyboard cable to the motherboard (red) and pull the tab attaching the trackpad controls to the motherboard (green). Remove the screws (red) holding the top part of the case to the bottom half, which are underneath the keyboard. Gently lift the top half up, allowing the cables we detached in step 2 to run through slowly. Unscrew the screw that is holding the DVD drive down (red). Carefully detach the speaker cable (green) from the motherboard and then proceed to unscrew the two screws holding down the motherboard (red). Gently lift up the motherboard. 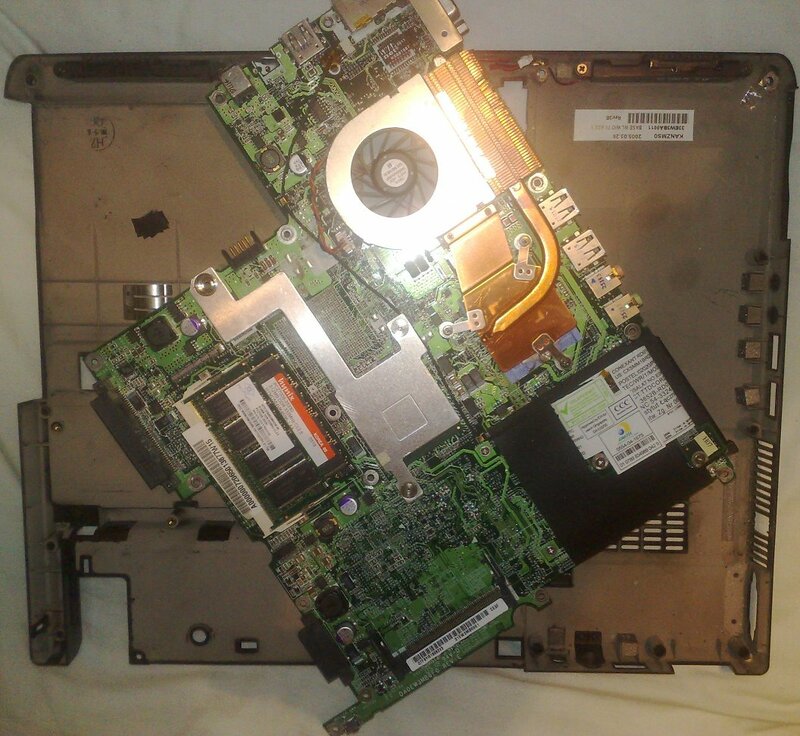 Congratulations, you’ve successfully disassembled your laptop! It is not necessary to remove the RAM from the system beforehand, nor do I recommend it unless you are intending to replace the RAM or achieve a complete disassembly. It can sometimes be quite difficult to remove/insert. Likewise, it is not required to remove the WLAN card, only the two antenna cables attached to it, though I prefer to do so as it means that if one has forgotten to remove the antenna cables, they won’t be pulled aggressively from the card during disassembly. When remounting the motherboard, pull the speaker cable through before you screw the motherboard down. It’s difficult trying to pull it through afterwards without unscrewing the board again. When screwing the motherboard down, the screw holes you need to use are marked with 2 arrows. The two antenna cables should feed through a little gap between the DVD drive, the motherboard and the case. I usually find that it is easier to feed these through and then insert the DVD drive. Although it’s possible to do this in reverse, it’s a lot trickier to poke them through this way than to feed them through and pull them through before inserting the DVD drive. If you don’t get any audio / video when you’ve put everything back together, check that you have attached the speaker cable and the LCD screen cable to the board. 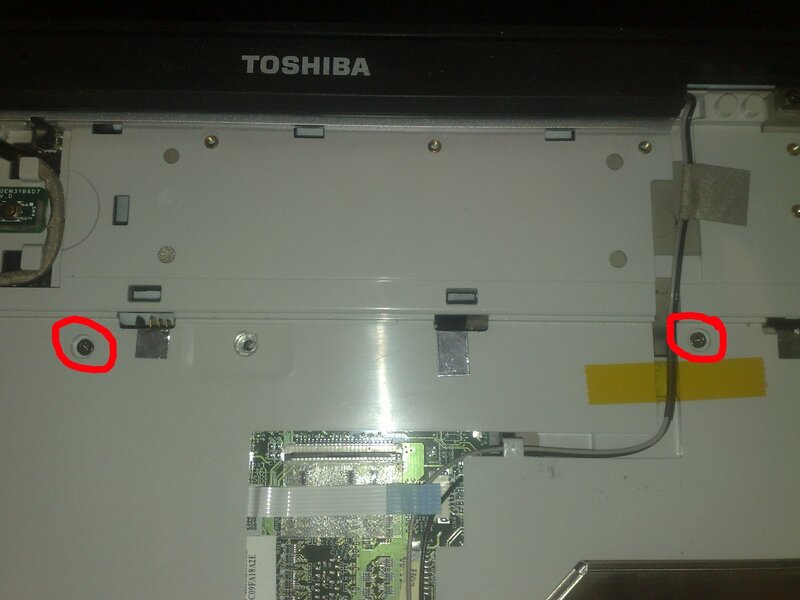 When turning the laptop on for the first time after reassembly, you may find it hangs on the ‘Toshiba’ screen for a minute or so. Don’t worry! It hasn’t crashed! It’s merely reassessing the computer. Particularly if your CMOS battery has died, it will probably tell you to accept changes or enter setup. You should do so and make sure the date/time is set correctly. 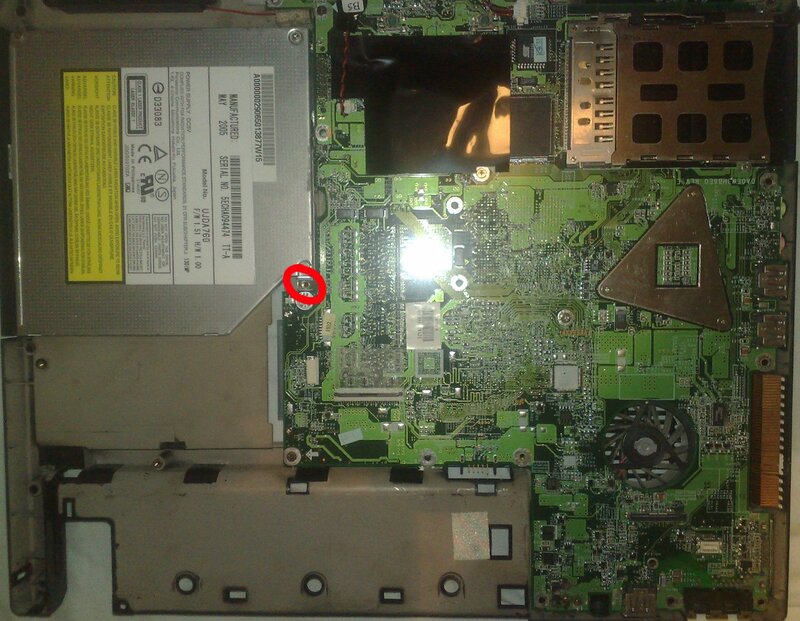 The CMOS battery is located at the bottom right of the motherboard near the optical drive. 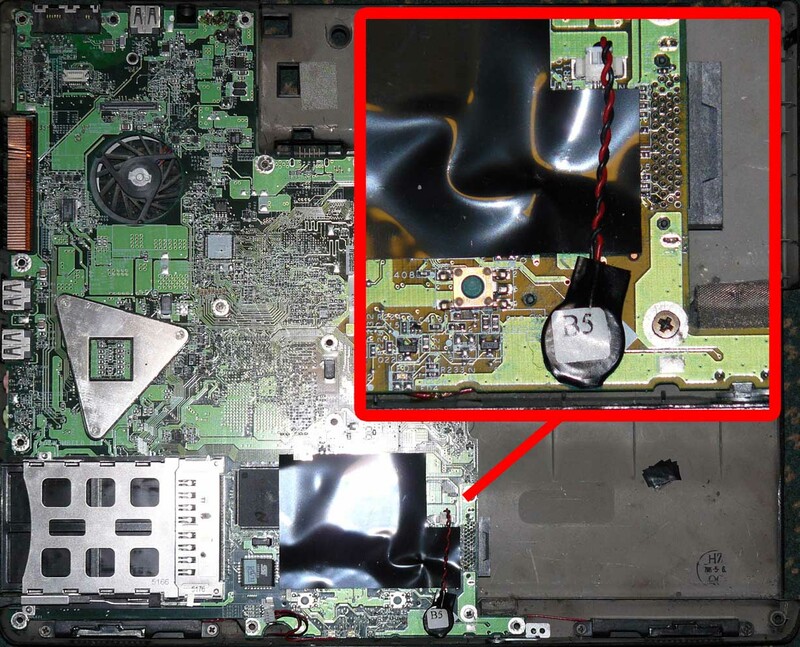 This guide is featured on repair4laptop.org, a great directory for laptop disassembly instructions. If you’re trying to disassemble a different laptop and this guide has not been able to help you, be sure to check them out.